The Bulova Precisionist is the world's most accurate watch with a continuously sweeping second hand. With a frequency of 262.144 kilohertz, the Precisionist offers the highest vibrational frequency available in any watch today. This dramatic increase in frequency diminishes the effect of temperature fluctuations and produces extraordinary precision. Most quartz watches are accurate to 15 seconds a month. Bulova Precisionist is accurate to... 10 seconds... a year. 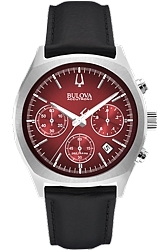 The Bulova Precisionist is a quartz watch with a second hand that beats 16 times per second. As a result, the continuous motion of the Precisionist second hand is even more fluid than all mechanical watch second hands that beat only 5 to 10 times per second. This marks the most comprehensive and potentially revolutionary product launch from Bulova since the debut of Accutron 50 years ago, Precisionist brings the watch industry a new sense of dynamism, an excitement that redefines the expected. The Bulova Precisionist Champlain model 96B133 is the flagship of the entire Bulova Precisionist line. It features a TITANIAM CASE & BRACELET and a Carbon Fiber Dial with a Red Accent Second Hand. This is a very large men's watch at 46.5 millimeters diameter (50 millimeters with the setting cron), yet it is lightweight and comfortable. It is depth tested and water resistant to an amazing 300 meters (1,000 feet) below sea level. Most accurate quartz in the world. 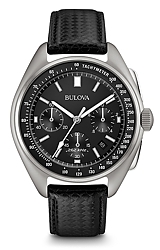 TopFlight Watches is an Authorized Bulova Watch Company Dealer. We do NOT EVER sell offshore or so-called Gray-Market watches. Your Bulova watch will be brand new, factory fresh, fully boxed with all Warranties, Instruction Booklets and product information. 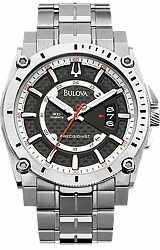 Plus, you can be absolutely certain your Bulova Watch Three Year Manufacturer's Limited Warranty will be honored by Gem of the Day, the Bulova Factory Servicenter and All Bulova Dealers worldwide.